Would you like to be left on a small island with these men? Like so many, many others, I spent Saturday marching through London expressing the desire to not be lead into disaster by a monstrous cohort of Wounded Leaders who do not wish the people of this country well. This is where I snapped the banner pictured below. If you have done any kind of inner work you know that you cannot feel safe or good around these kind of people. It is not possible. All inner figures rooted in sensitivity and vulnerability would run a mile from them. Those members of the public who think they are funny, clever or brave reveal that they haven’t gone anywhere near the insides of their own psyches. Here I will except the vast majority of the traditional working class who voted against Europe, because they were not given anything else to vote against and they need to protest that the technological future and globalised capitalism is making them almost utterly redundant and no one is listening – except these monstrous exploiters of other people’s vulnerability. But let’s return to Saturdays celebration, because it was a protest but also a celebration of life. The march was an extraordinarily joyful event rooted in togetherness and neighbourliness to Europe. It was peaceful and there was hardly a Bobby to to be seen. And yet it was shamefully reported by the BBC, whose news outlets – both TV and radio – immediately switched to Brexiteer criticism and top-down leadership gossip. This is somehow worse than ‘fake news’ because it is so seamlessly done. 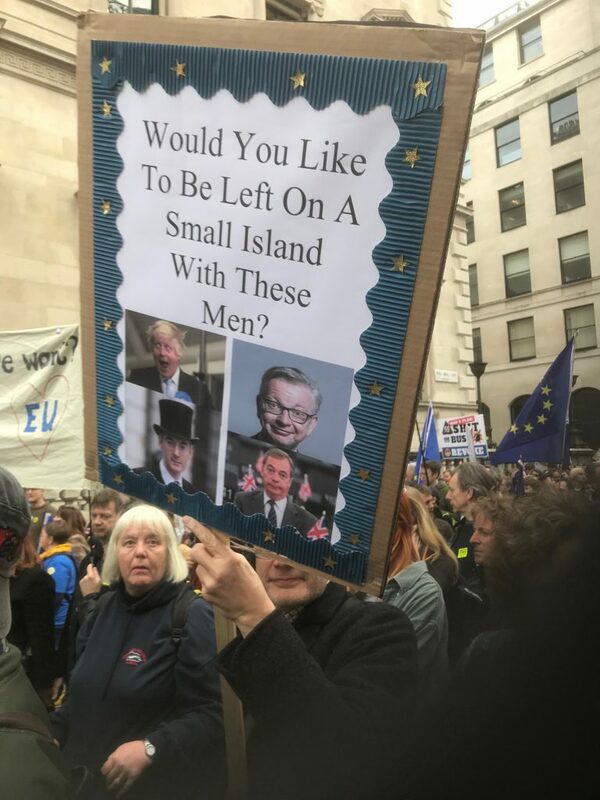 There was no mention on ‘the Beeb’ of the proliferation of witty posters; it’s how you know you’re on the right side (sad as it is for there to have to be ‘sides’) because the wit is so life-affirming, in contrast to the angry, cold sarcasm, the cries of ‘betrayal!’ and the threats of violence that come from the other side. No, the Beeb just stokes up the polarisation. No mention of the delightful singing of “Should we stay or should we go?” nor of the brass band playing a long, potent slow version of Marvin Gay’s “Sexual Healing” as we inched into Trafalgar Square. These things belong to the embodied life, not the dissociated drive to take control. I missed all the speeches, but you can catch them here. Oh yes, no mention on BBC News of Conservative Michael Heseltine’s Shakespearean oratory nor of Caroline Lucas (who generously hugged my friend!) truly prime ministerial delivery. It’s really outrageous. And if the joy and the fun of being pro-life is still in you, you could enjoy dreaming to the mini-sequel to the “Age of Stupid”. By submitting a comment you grant Wounded Leaders a perpetual license to reproduce your words and name/web site in attribution. Inappropriate and irrelevant comments will be removed at an admin’s discretion. Your email is used for verification purposes only, it will never be shared.